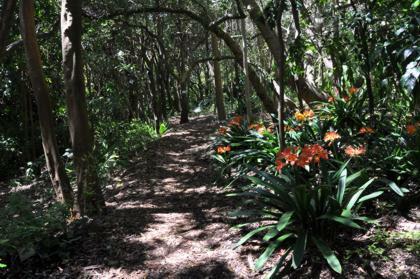 The Arboretum is located south of Mathews’ Rockery and adjacent to Van Riebeeck’s Hedge. It is a collection of over 450 southern African tree species, many from the subtropical regions of eastern South Africa, which grow very well on these warm north-facing slopes of the Garden. The Arboretum also displays shade-loving herbaceous perennials, shrubs and bulbs that grow in the middle- and understorey, or on forest margins. The new Centenary Tree Canopy Walkway, nicknamed ‘The Boomslang’, is located in the western half (mountain side) of the Arboretum. It is a steel-and-timber raised walkway that snakes its way through and over the trees of the Arboretum taking visitors into and above the tree canopy and offering spectacular views of the mountains and Garden. In the Arboretum, mulch paths wind their way through well grown trees and a wide variety of sub-tropical ground covers, bulbs and herbaceous plants create a beautiful understorey. You will see Ocotea bullata (stinkwood), Zanthoxylum capense (knobwood), Trema orientalis (pigeon wood) and many more, including a magnificent specimen of Aloe barberae (tree aloe). It towers some 18 m and is a sight to behold in winter (June) when it is in flower. In late summer and autumn (Feb-Apr) herbaceous Plectranthus species (spur flowers) flower in shades of blue, purple and white, and in spring (Sept-Oct), orange Clivia miniata (bush lily) light up the shade. On the Tree Canopy Walkway, you can sit in the canopy of a big old Olinia emarginata (mountain hard pear), and get up close and see the birds feeding on fruits and flowers of trees such as Celtis africana (white stinkwood), Cassine peragua (Cape saffron) and Erythrina lysistemon (coral tree). The Arboretum is home to many different animals and birds. The porcupine, Africa’s largest rodent and destroyer of bulbous plants, is a regular visitor. The caracal is said to be a resident and the rare Cape fox has also been seen here occasionally. There is evidence that grysbok, who live mainly in the undeveloped parts of Kirstenbosch, also occur in this section. This is an excellent place for bird watching.